Paula Vogel began writing "The Baltimore Waltz" in 1989 as a sister's remembrance of her brother Carl, who died of AIDS in the 1980s. The show premiered at the Magic Theatre in 1992. On top of being a memoir to her brother, it is also a farcical, magical-realism look at the medical snakepit of those early days of AIDS research. The show is directed by Jonathan Moscone, but it does not have the power in 2017 that it had in in 1992. The 1980s and 1990s, the dreaded Baby Days of AIDS when fear was the dominant emotion, have become the 2000 Teens when people with money and access to AIDS drug-cocktails no longer need succumb to this disease. Yes. thousands still suffer and die around the globe, but this story is about middle-class Americans from Baltimore. So for it to work on a visceral level we need to be involved with the characters in the story. Sadly, with all the high-jinks and reversals of roles, plus the unfortunate decision to speak to the audience as if it is 2017 (example: in the above photo, Lauren English (center) says, "Where am I, in an HMO?") we have far less emotional stake in the lives of our characters. Certainly less than we may have had in 1992. Lauren English plays Anna, Patrick Alparone her brother Carl and Greg Jackson all the other roles. Jackson is terrific in the same way he was playing the multiple roles in "A Gentleman's Guide to Love and Marriage," English uses evocative facial expressions to display her many internal struggles and Alparone is an excellent actor but he is also straight-jacketed by the audience's realization right off the bat that these characters are only pretending. 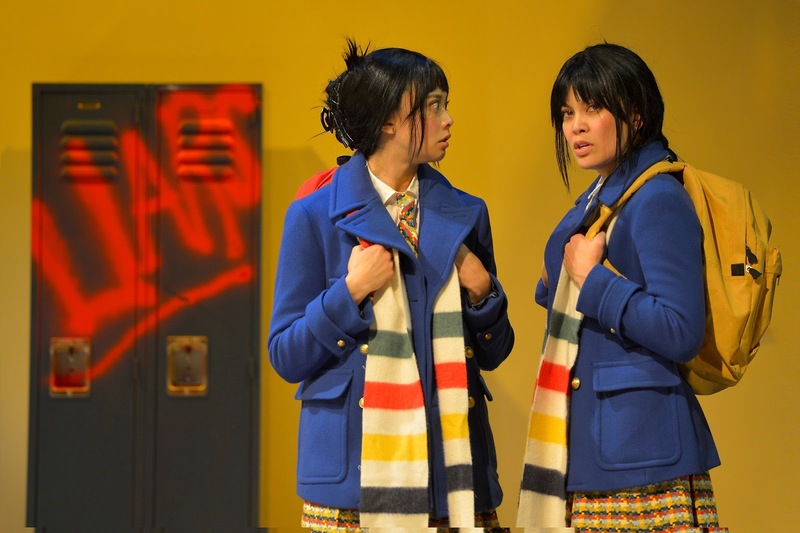 There are symbols spread throughout the show (such as the rather inexplicable stuffed rabbit) that will resonate with many in the audience. But inconsistencies make these signals confusing -- why did Carl have to hand the rabbit to Anna when they are going through customs? We figured there was some kind of metal inside it, but perhaps that is because we are watching this show twenty-five years after its premiere. And what is with the Nazi-era black-gloved hand of the Austrian doctor? Does anybody really think this stuff is funny any more? Paula Vogel wrote a moving theatrical epitaph to her brother twenty-five years ago that still carries a lot of angst with it. Missing those who have gone before us never goes out of style. 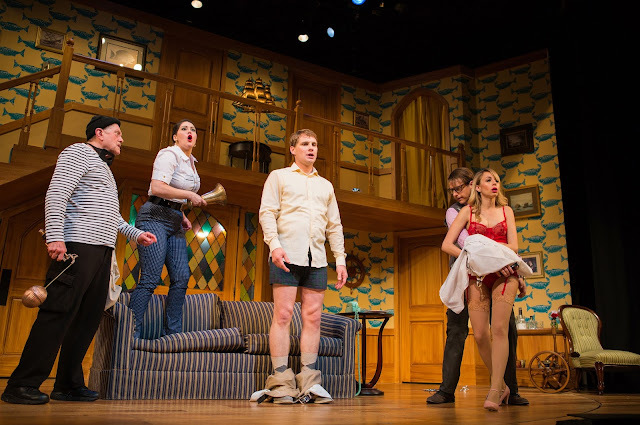 It felt like everyone in the audience had seen "Noises Off" at least once before. Between Act One and Act Two people on all sides of us were giggling with excitement during Intermission. 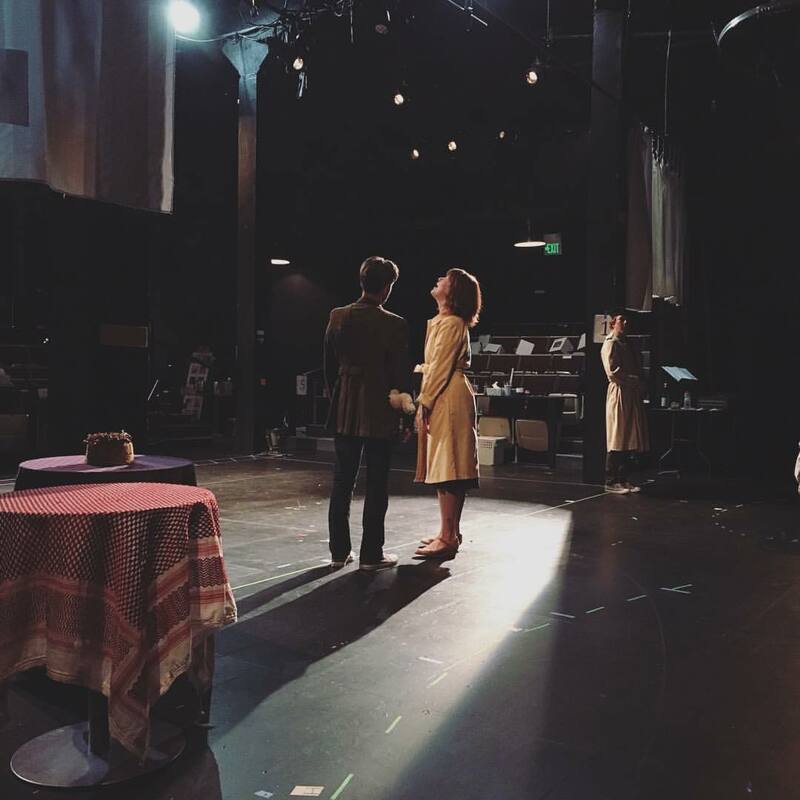 "Just wait 'til Act Two," they said. They were right, but Act One is very funny too. Michael Frayn's show-within-a-show premiered in London in 1982 at the Old Vic. The show is Farce with a capital F, filled with randy actors, a frustrated director and two excellent behind-the-scenes technicians who are also understudying for every major role, seeing as the principals could disappear or pass out dead drunk at any moment. Act One is the last minute rehearsal before Opening Night, and Act Two is the same show seen from behind the curtain as everyone scrambles to get out the correct door wearing the proper costume. 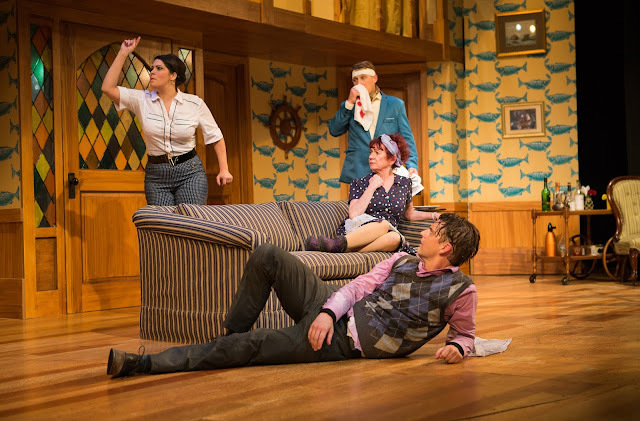 The latter half of Act Two is that same show, on Opening Night, seen from the audience's viewpoint, as the drunken cast memorably screws everything up. The show we have already seen in rehearsal, now seen from backstage, is the brilliance of "Noises Off." So yes, the first half of Act Two is terrific. ("Noises Off" is a stage direction indicating a voice that comes from Off Stage.) Belly laughs and gasps for air. Doors. Lots of doors. 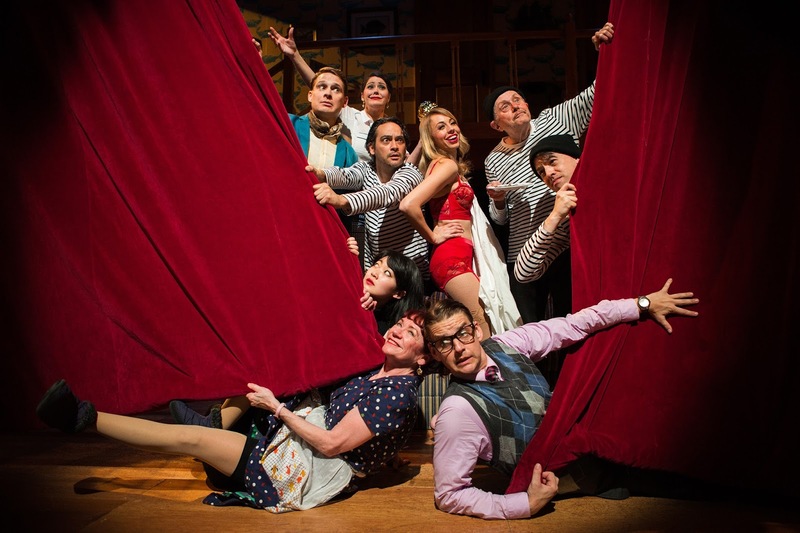 The cast is packed with San Francisco Playhouse regulars, such as Johnny Moreno as the Director Lloyd. Lloyd is carrying on simultaneously with Brooke (Monique Hafen, resplendent in red underwear) and Poppy (Monica Ho, as the stage manager but also understudy to Brooke so she wears red underwear too). Marvelously dotty Dotty, played by Kimberly Richards, is eventually having a fling with...is it Gary (Patrick Russell)? Or is that Belinda (Nanci Zoppi) with Gary? No, she's with Frederick (Craig Marker). Doesn't matter. 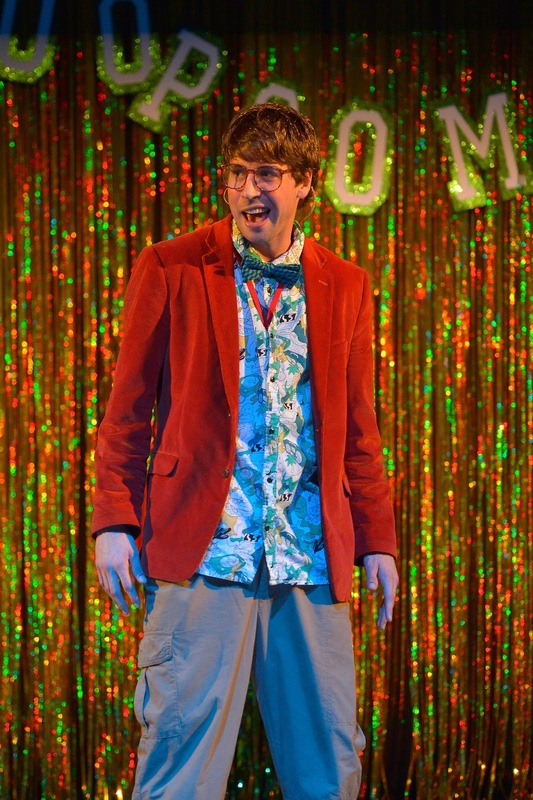 Certainly, the show is stolen by Richard Louis James who plays the doddering Selsdon. Selsdon's mission in life is to get his hands on the bottle of whiskey brought backstage by Lloyd. That bottle of whiskey succeeds in its mission to destroy any chance this crew had of surviving Opening Night without taking down the curtain. Selsdon's lines are basically incomprehensible to us, but we don't care. We love him. 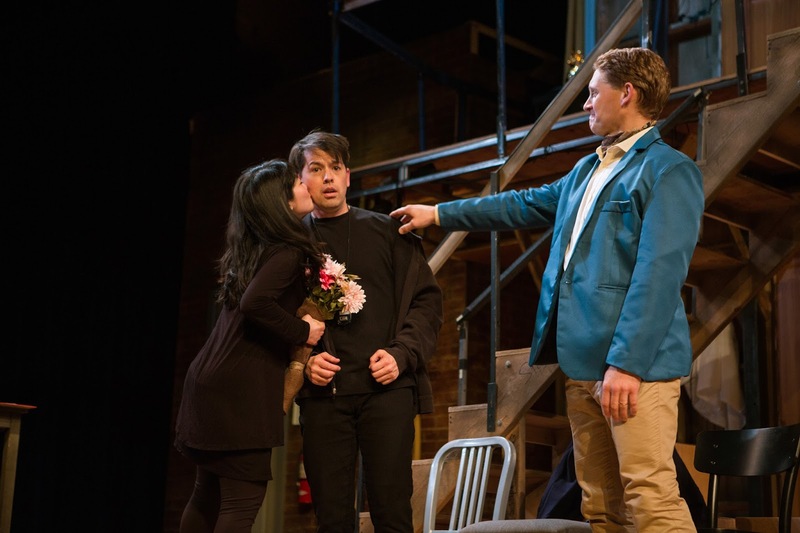 We also love the show's savior, Tim, played by Greg Ayers, seen above as Selsdon's understudy, with Nanci Zoppi understandably dubious. What a difficult show to mount and choreograph. Director Susi Damilano will not sleep until the run is complete. 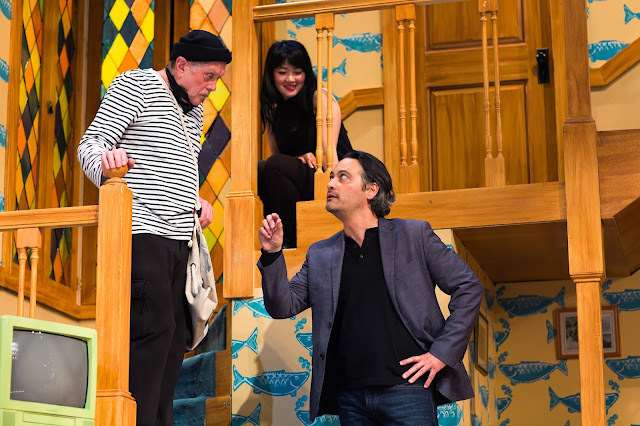 The San Francisco Theater Blog awards "Noises Off" Three Stars with a Bangle of Praise. Act Two plays a little long but this will improve during the run. Acting, Set and Story earn one Star each with the BANGLE for Damilano's figuring out how to get everyone in and out on time. As it were. Wow! We have just seen brilliant acting and directing, an eye-popping production and a fascinating story filled with laughs and surprises. What's not to like? Nothing. "Peerless" is as good as anything we've seen yet in 2017. The author, Jiehae Park, says we are seeing a modern Macbeth, that she took her title from a speech by Banquo. That's author and reviewer talk. Shakespeare never made us laugh this hard. 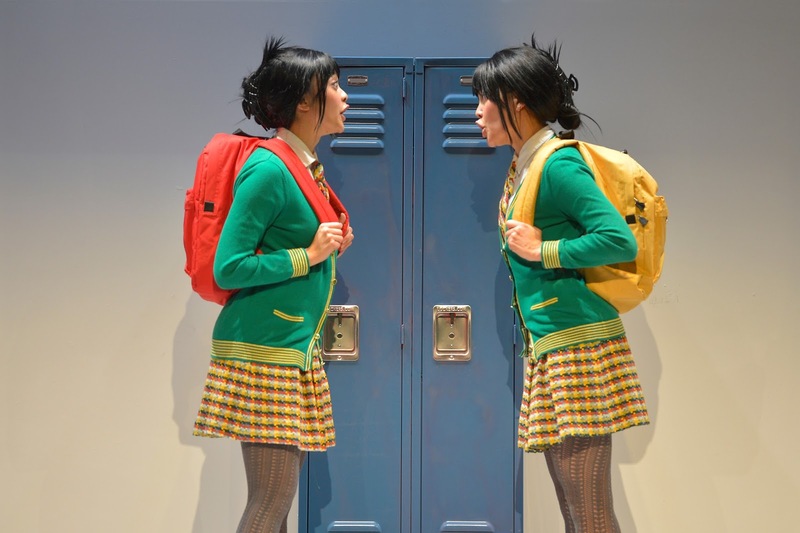 Identical twins L (Rinabeth Apostol) and M (Tiffany Villarin) are every college administrator's nightmare. Consumed with getting into The College, where only one student from their school may be admitted each year, L and M have everything planned out perfectly, including transferring into a favorable suburban location and getting all their stats, extra-curriculars and grade-point averages in order. One will get in this year and one the following year, according to plan. You and then me. Except for D, played fabulously by Jeremy Kahn. He is the one who has been given Early Acceptance into The School, not L. or M. Jeremy has allergies, ah, there's the rub. Then there is BF (Cameron Matthews) and Dirty Girl (Rosie Hallett). 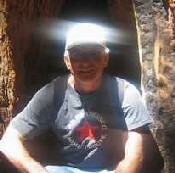 Anyone who stands in the way of L and M must pay for their toil and trouble. "Peerless" is as good to look at as it is to listen to. 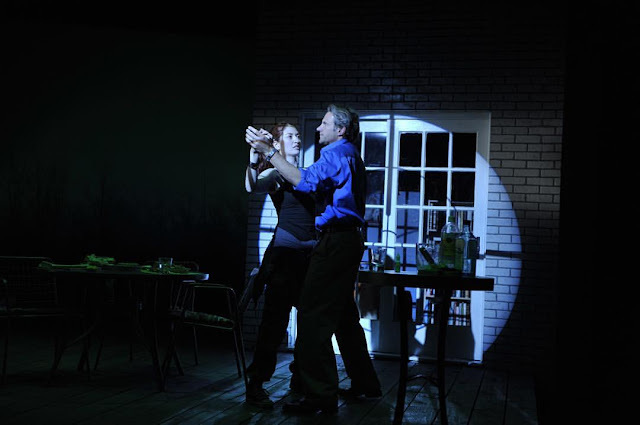 Scenic Designer Kate Noll and Lighting Designer Heather Basarab have outdone themselves. You never know which cool door someone will pop out of. And when they do, they are in Sydney Gallas's perfect outfits. 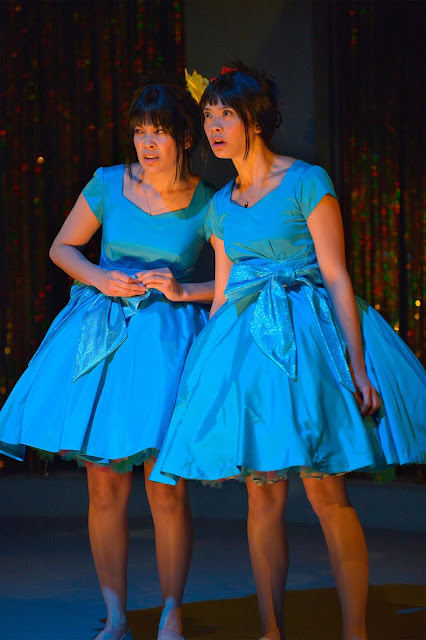 The Thank God I Am No Longer in High School subdivision of the San Francisco Theater Blog awards "Peerless" Four Stars. 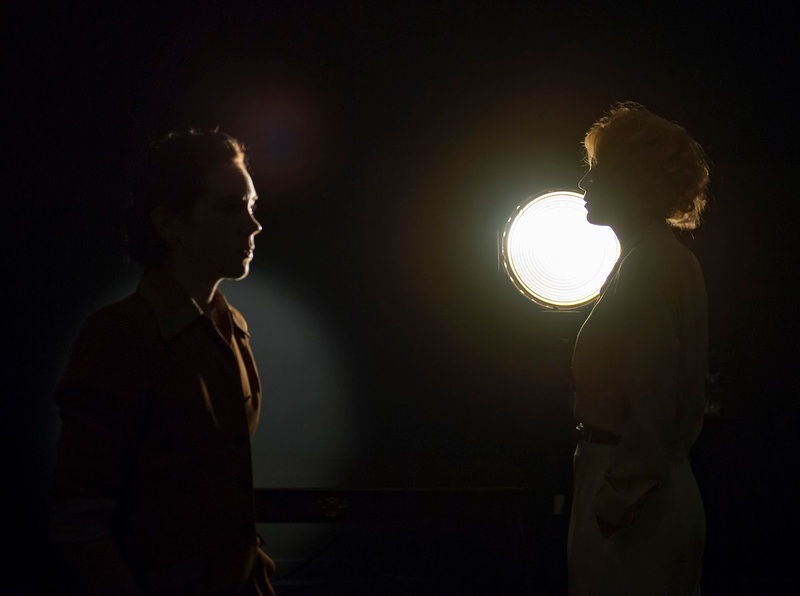 Acting, directing (Margot Bordelon), story and set are spot-on perfect. Make sure not to miss this one. 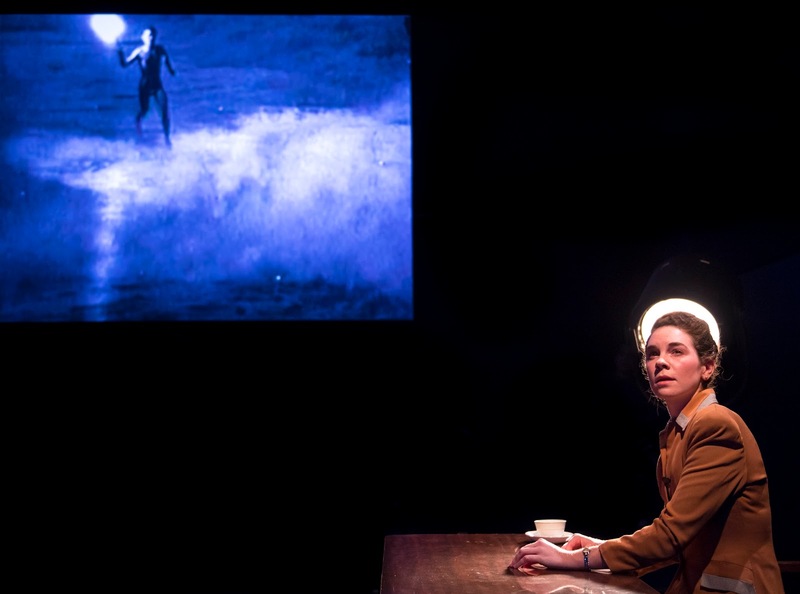 A two-actor ensemble of Martha Brigham and Stacy Ross, direction by Jon Tracy and a Northern California Premiere of Sarah Greenman's play "Leni" would seem to be foolproof. 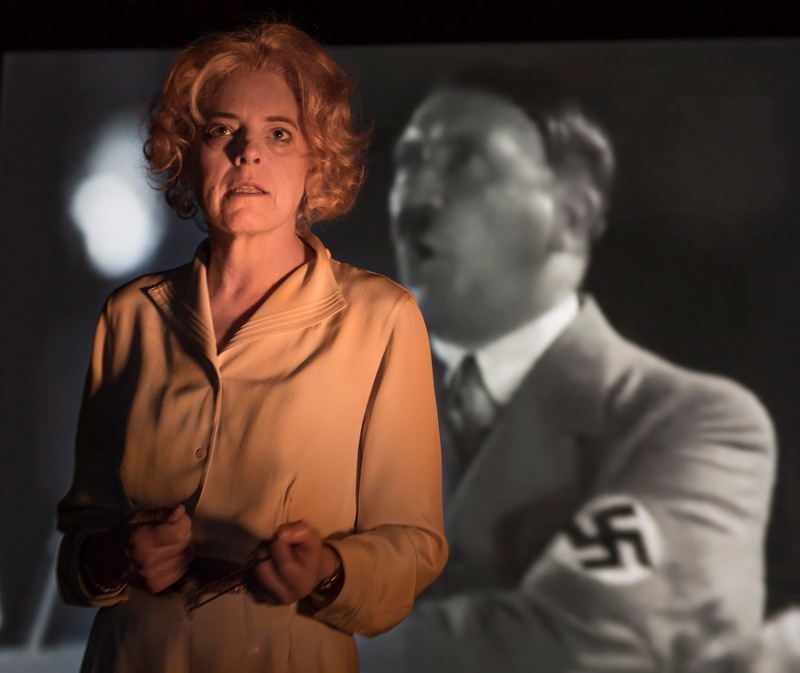 Featuring Brigham as the younger and Ross as the older Leni Riefenstahl, the German filmmaker known for two 1930s propaganda films in support of Adolph Hitler, Leni is a small theater piece that makes you think -- perhaps a little more than you want to. The younger Leni thinks it's all about her, while the older Leni tries to hide her divided self in film-talk, lighting and camera angles. The two actors work well with each other, though the film-making conceit combined with what appears to be the Nuremberg Trials is somewhat confusing. Projections from Liefenstahl's "Olympia" and "Triumph of the Will," broadcast on the wall of the small upstairs Harry's Stage, are quite effective. They serve to give us an idea of how and why these films came to be so severely judged after the war. It was always about Hitler. The awards before and the denigration and denunciation after had little to do with Leni, but she is the one who was never able to work again as a director of films. The history is fascinating, as are the chilling comparisons to the times we are living through now. 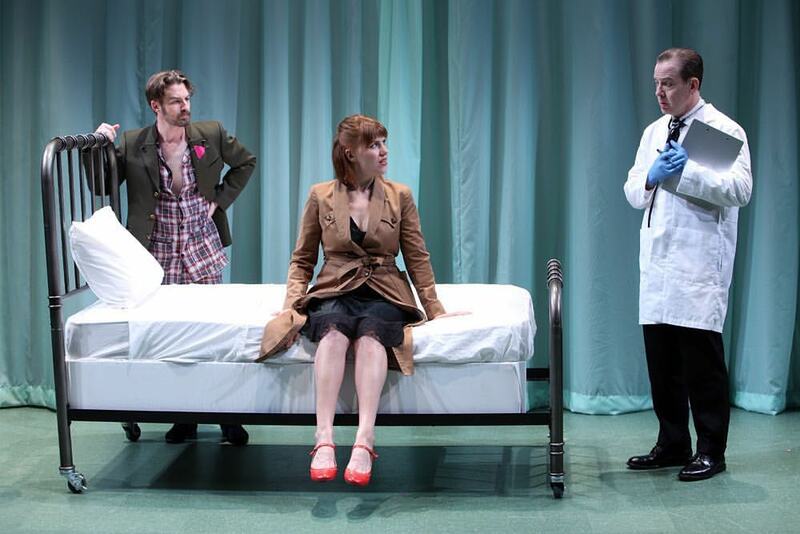 We wish the play itself had more to it. We have seen Martha Brigham several times in the past few months in excellent roles, but here Jon Tracy seems content to have her feign fury at her older self, while Stacy Ross, one of the Bay Area's finest actors, seems confined in an ersatz German accent. 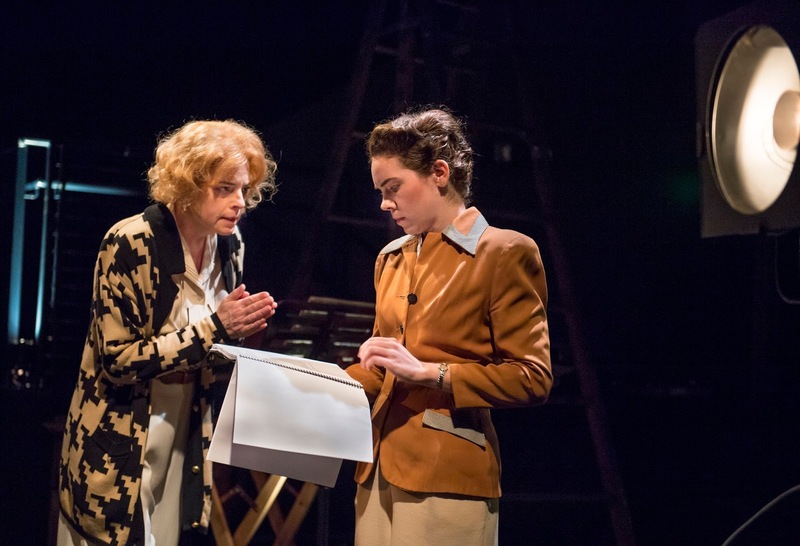 For us, the fault is not with the actors but with the play itself, which comes across with a lot of sturm but perhaps not enough drang. 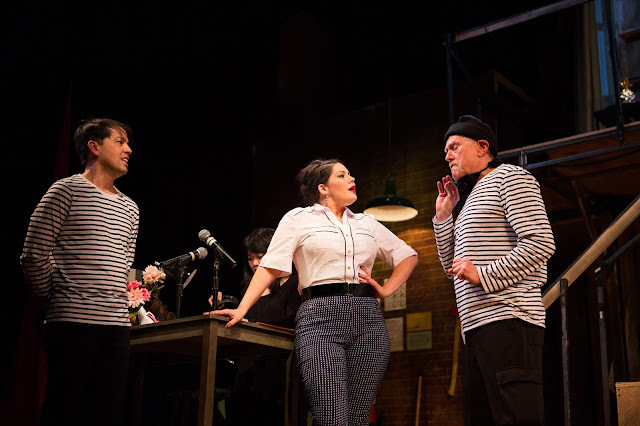 The San Francisco Theater Blog Awards Division awards "Leni" Two Stars with a Bangle of Praise, one star each for Brigham and Ross and a Bangle of Praise for the renovation of Harry's Stage. This rating places this show under the Julie Andrews Line of recommendation -- those who love the actors will enjoy watching them work, but in the end the more we know about Leni Riefenstahl, the less we like her. 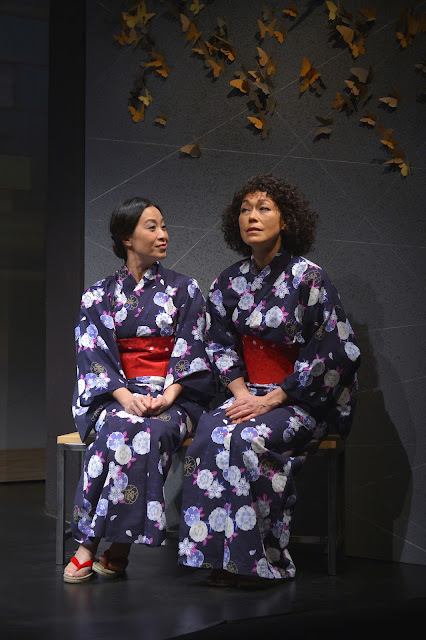 Two cousins, one Japanese and one Japanese-American, the first living in Tokyo and the second in Los Angeles, are attempting to reconcile their mothers, who are sisters. The two older ladies quarreled as younger women over the love of a man and have never been able to get past it. Now they live thousands of miles from each other. 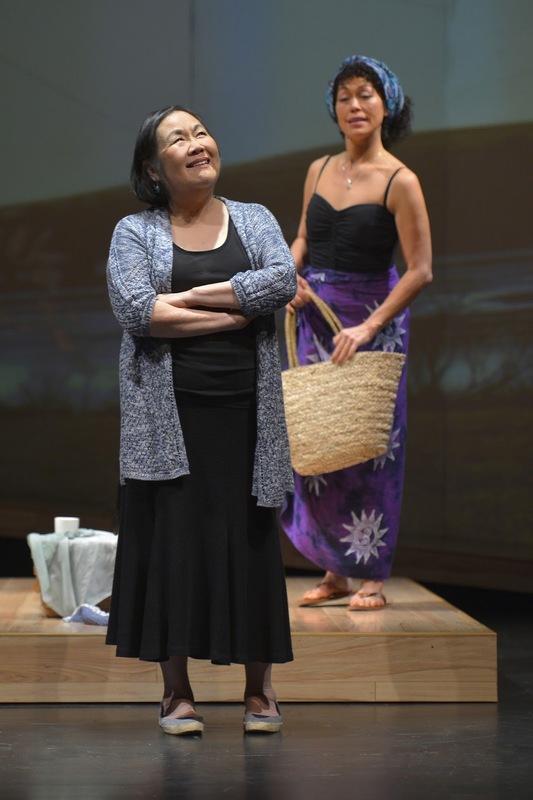 Their two daughters are determined to bring their mothers back together. Or...are they? 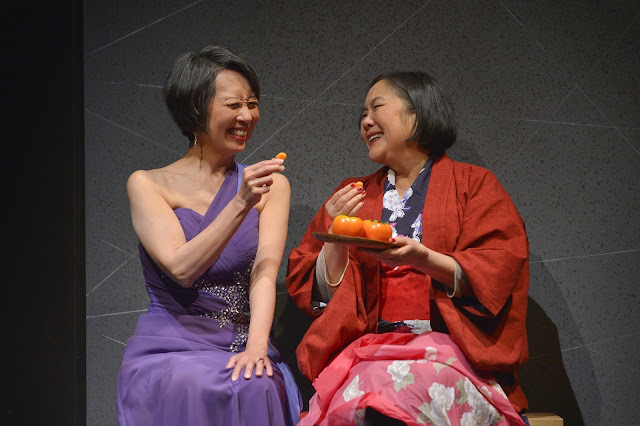 Hiromi (Mia Nagano) and her mother Noriko (Emily Kuroda), in California, are prepared to travel back to a Japanese Hot Springs for the reunion, but Sayuri (Elizabeth Pan) is having trouble convincing her mother Natsuko (Jeanne Sakata). The younger cousins, who talk intercontinentally on Skype, have built a relationship through the years while the older women have remained angry at each other most of their lives. Central to understanding "Calligraphy" is the concept of filial piety, and how Sayuri, who has remained in Japan caring for her mother, longs to escape. There is also the issue of racism, since Noriko married a black soldier and therefore Hiromi is half Japanese, half-African American. But in the end, it is about the power of family. How will these four resolve their issues? 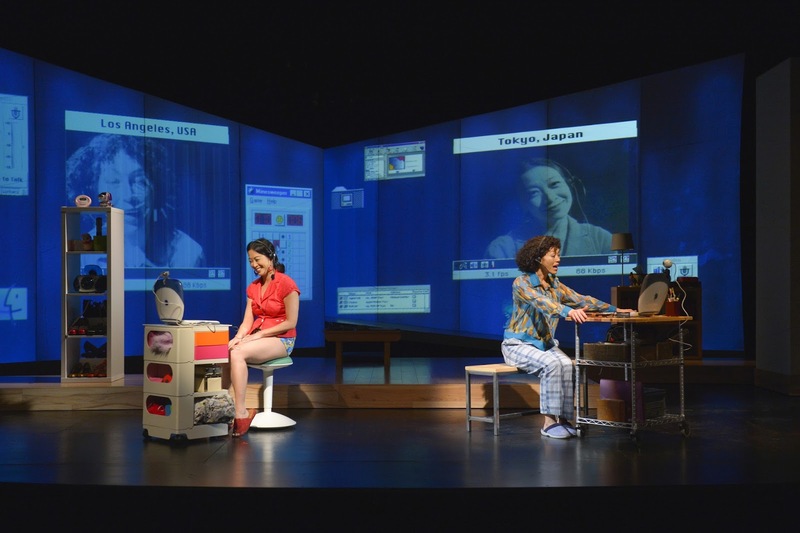 The San Francisco Theater Blog Awards Division awards "Calligraphy" Three Stars. 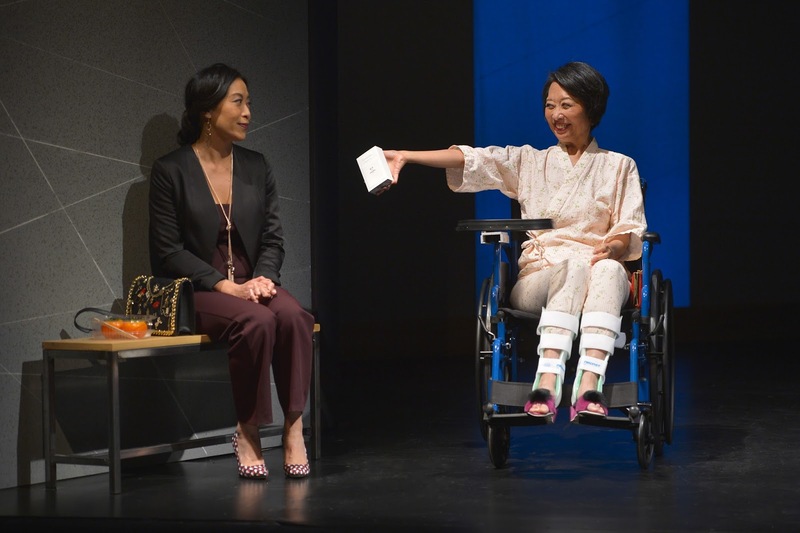 We find it a little difficult to understand how Sayuri can do what she does at the end. Her character, and that of her mother Natsuko, are not easy to like. This makes the final resolution somewhat problematic. Still, the acting is good and the story interesting enough to recommend coming to see.